It seems that within any established group, order, dynamic, organization, etc., the pervasive Trickster archetype can be found to one degree or another. Much has been written about the Trickster aspects associated with paranormal, parapsychology, and esoterica—all subjects especially ripe for emergences of this archetype. Another area that seems ripe as well is language itself. The association of Trickster dynamics with the paranormal is obvious. But why language? Perhaps because its deepest nature is absolute symbolism. Symbols by nature are a proxy—one thing standing in for or signifying another. There's always an imprecision at hand—a distance between the symbol and symbolized. This innate gap is a comfy fit for Trickster energy. I've written before on the Trickster nature of the Ouija Board, making a case for it being a poster child for contemporary paranormal culture. 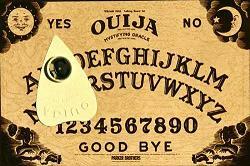 The whole point of the Ouija Board is for otherworldy communication, and that is possible because of the complete alphabet it sports. Granted, an inverted wine glass can be used on a plain tabletop as a divination tool, using a very similar physical method as with Ouija. But, the solid, warning narrative that has developed around this method of divination is reserved specifically for the Ouija Board. It is a 'portal', and 'uncontrollable'—you never quite know what you're really communicating with--lower entities will pose as higher ones, or so goes the canned legend. When it comes down to it, the Ouija is quite liminal, very Trickster-like. It is the alphabet that allows this; absolutely anything could be communicated. Because of the lack of physical source—an invisible, intangible writer or speaker of unknown nature-- the words alone become threatening, scary, regardless of their benign or mundane superficial meaning. The Ouija is just one example of alphabet Trickster dynamic. Alphabets are involved in all types of tales and theories of myth, legend, religion, and esoterica. Academic, philosophical, or mystical ruminations on 'deeper meanings' of letters and language often reveal truly profound, very reflexive dynamics. A few examples of this are found within the work of William Eisen, Stan Tenen, as well as certain esoteric theories involving the study of cymatics. This all suggests letters are not simply what they appear to be, but may be intrinsically meaningful and communicative. Within dynamics that have Trickster written all over them, a deeper, or token Trickster often emerges. For example, within Catholic-influenced Mexican folk religion, the Goddess Santa Muerte has emerged. Although there are other close cultural bases for this goddess figure, looking at the overall aesthetic representation of Santa Muerte, it's obvious the Virgin Mary is the inspiration, and particularly the Virgen de Guadalupe. In this case, there's almost a Trickster-by-degree effect. The Virgin Mary is generally a very notable Trickster figure; there are her subversive apparitions, and associated fortean type phenomena, as well as the gender and identity issues raised with the idea of feminine deity. 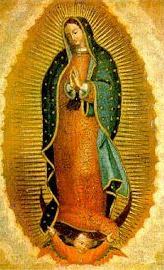 In addition to these same qualities, the Virgen de Guadalupe has an even more controversial and mysterious identity. Her appearance to Juan Diego, and resultant miracle-image on his tilma have all kinds of high strangeness and reflexivity going on. There are ideas that the image is actually coded. Also, smaller images of people in various pertinent scenes have been detected within her eyes. 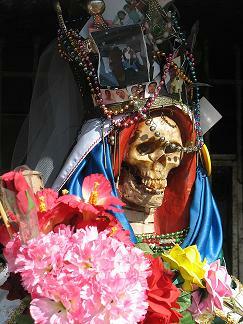 With Santa Muerte, most representations convey a definite Virgen de Guadalupe stance, with similar clothing. However, with this goddess, the Trickster aspect is literally down to the bone. There's something at once so wonderful and grim about her, blasphemous and holy at the same time. More examples of this mascot-Trickster idea: FOX network, clearly a Trickster within mainstream network TV, has Bart Simpson, a classic Trickster figure if there ever was one. The internet, which has been described as Trickster-like, has the much lauded and maligned, constantly shapeshifting Wikipedia. When you find a group or dynamic firmly aligned with Trickster energies, there's likely going to be a Grand Poobah, king mascot-Trickster to emerge within the whirlwind. So, if the alphabet can be seen as having large Trickster qualities, what member would emerge as a mascot?